Everywhere I look, there are signs of a shiny, bright, perfect Christmas. Smiling family photos. Perfectly decorated homes and trees. Happy people enjoying happy friends at happy Christmas parties. Christmas movies that elicit giggles and end in magical first kisses. Cookies and hot cocoa and fires and snow (or at least dreams of it). Sometimes Christmas is all of those things. Since my dad died five years ago, Christmas has been an exciting distraction. Taking time for extra fun and favorite traditions lightens the grief-burden for a few weeks. And then, without notice, Christmas becomes less about the shiny, bright excitement and all about the brokenness. Christmas is a baby born homeless and under unusual circumstances. His family became exiles (refugees, even). Christmas is God choosing to give up the luxuries of heaven to subject himself to the human experience. Christmas is the holiday for the broken hearted. Reality is, over the course of a lifetime, we’ll each have at least one less-than-ideal Christmas. Maybe you’re lonely. Or disappointed. Or hurt. Maybe Christmas reminds you of bad memories or unrealized dreams. Christmas isn’t an eraser or even a remedy for the hurts and bruises of life. And don’t try to ignore Christmas, that won’t dull the pain or make it disappear. This advent season, the month we spend anticipating Christmas, I have intentionally made life quiet. 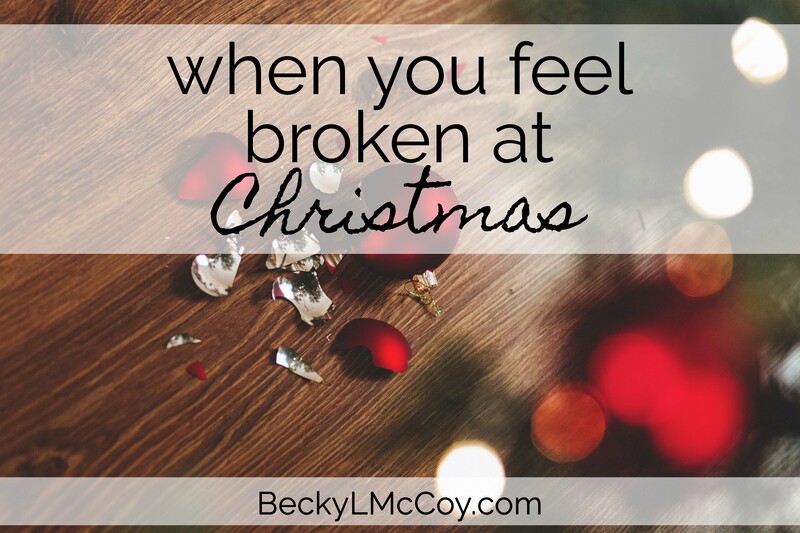 In all of the excitement of the last few Christmases, I have missed opportunities to discover what it means to embrace my brokenness at Christmas. Christmas isn’t magic. Instead, Christmas promises new life. Christmas doesn’t heal my broken heart, but it reminds me that my grief is not permanent. I meditate on the past with both smiles and tears, taking deep breaths, and moving forward because I know my story isn’t over. 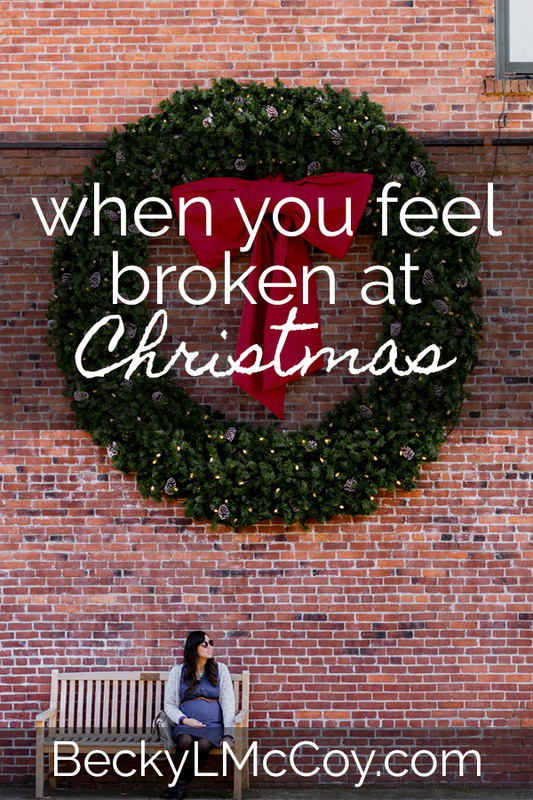 God gave us Christmas because he knew we wouldn’t be able to fix our broken selves. The miracle of it is that the solution wasn’t glamorous or impressive. The solution was a baby, born into desperate times and in the least likely of places. God’s solution to my broken heart was humble and subtle. If this Christmas, you are anxious for prayers to be answered and hope to be revived, be encouraged. Advent is a season of anticipation and of desperate prayers for an answer to the cries of a broken heart. And still their flame is strong. Is still the watchman’s word. If you find yourself “heart-sick with hope deferred” and no sign of Hope on the way, remember that Advent is for the longing, broken hearts. If your heart is anxious for rest, let this Christmas be the year you embrace the Gift and soak in the Grace that was born to love us like we’ve never been loved before. Having a hard time getting through the holidays? Download 3 Truths (and a lie) For When Life Is Ridiculously Hard and wallpaper your house with it. The holidays are an exciting time for me. I love spending time with family and friends. I have no children so I host most of the get together. I love it. The dates are the same every year times too. Invites are sent out after Thanksgiving a remind when it gets close to the date. However this year people say they forgot or they committed to something else. This has been a hurtful Christmas. I hide this and try to show excitement for them. One party only three people have RSVP out of 10. Did I do something wrong.? Is everyone tired of coming? They even sometimes ask me about them. Should I cancel them? My heart secretly aches. Am I being selfish.? I feel this Christmas is less then what it normally is. Christmas is going to be lonely this year. I have no one to celebrate with. I have never minded because of all the fun and joy I had prior. However I am trying to find some joy but struggling.